Looking for some unique souvenirs to bring back home from your trip to Ecuador? Ecuador is a mega-diverse country in flora and fauna and this provides with quality materials for the production of gorgeous jewelry. Materials can come from shells, nicely coloured like spondylus, wood very expressive as chonta, seeds as huayruro, as well as tropical plants. Plants such as: tagua, known worldwide as the vegetal ivory, which is a seed that is used for making different souvenirs as well as beautiful jewelry. The country has also a mining industry with silver being one of the main minerals used for jewelers to make fine jewelry that is sold and exported world-wide. 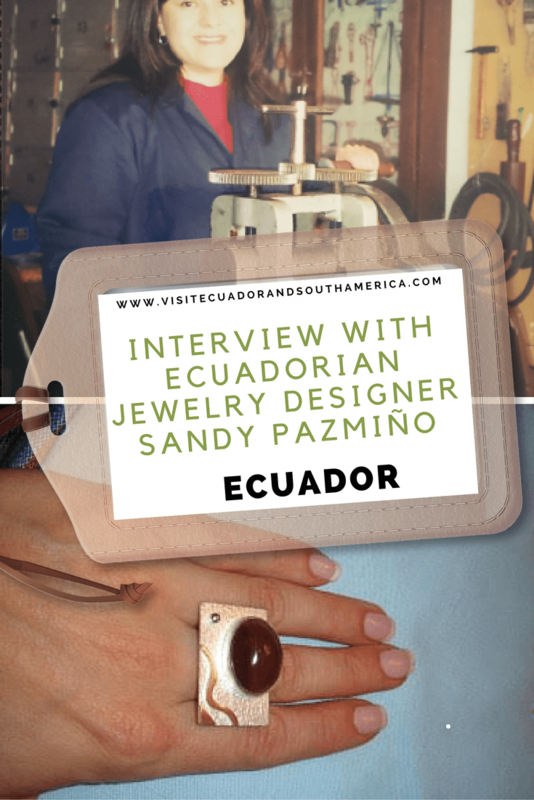 I had the pleasure of interviewing passionate jewelry designer, Sandy Pazmiño. 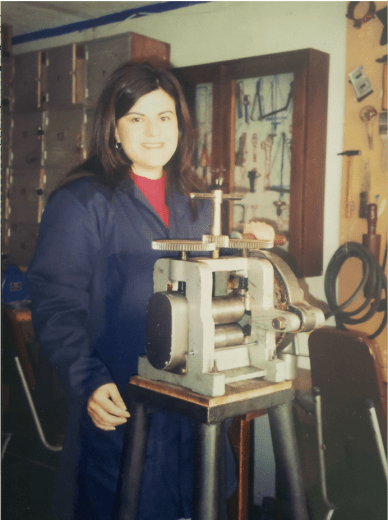 During the las 10 years she has been formally immersed in the art of jewelry designing. For her it is all about expressing with her hands. What is jewelry designing for you? It is polishing an idea and turning it from an image, a thought which often comes in the middle of the night without thinking. I have a notebook always at hand in which I can draw or write the first idea in order not to forget it. How does your work process look like? It starts with the melting, then: rolling, tilling, cutting, welding and shaping the piece to be unique. Even if there was a second piece, it might be similar but not the same. Each one is designed and developed at different times of my life. Each reflects a part of my emotions and moments, mixing colors, textures. Such as: precious stones, semi precious beads, horsehair, wood, seeds and fabric have given me the experience to know that there are no limits for jewelry designing. Have you participated in a Jewelry exhibition? 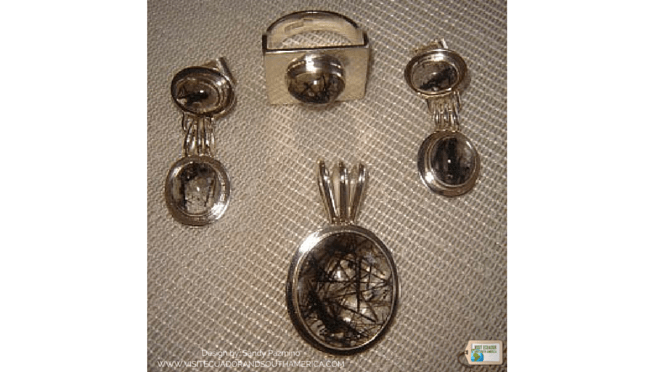 In August 2003 I made my first exhibition at the National Museum of the Central Bank of Ecuador “Ecuador Jewellery identity Estate III” in which participated several silversmiths. I had other small exhibitions in the Hall of the Municipal Palace in Quito, and in Unesco’s House in Quito. In 2006 I had the opportunity to travel to Minas Gerais, Brazil. After visiting each city I was absorbed and amazed by the plethora of varying colors, textures, shapes and sizes of precious and semi-precious stones, which inspired one of my most beloved collections in which I expressed all lived during that trip. In a few words, what is this art for you? I live to create, to live and to think that my biggest reward is seeing the joy that each of my pieces generated in the people who liked my work. Having so much inspiration around and knowing so many other creative people, I am grateful for all the resources available for me and for all challenges of creating. Whether you are searching for some exclusive jewelry or want to have some of your creations tailor-made by a designer, Sandy Pazmiño is the choice for you! You can visit her Facebook page, here. What better souvenir than beautiful 100% Ecuadorian jewelry? If you want more in-depth information and also a guide that you can bring along during your trip to Ecuador, I recommend the travel guide Lonely Planet Ecuador & the Galapagos Islands .